The world is changing for two girls in China in the 1970s. Da Qin Big Piano and her younger sister, Xiao Qin Little Piano live in the city of Wuhan with their parents. For decades, China's government had kept the country separated from the rest of the world. When their country's leader, Chairman Mao, dies, new opportunities begin to emerge. Da Qin and Xiao Qin soon learn that their childhood will be much different than the upbringing their parents experienced. Eight short stories based on the author's own life give readers a unique look at what it was like to grow up in China during this important time in history. The first thing I thought of when I started this book, was another book, Mao’s Last Dancer by Li Cunxin. 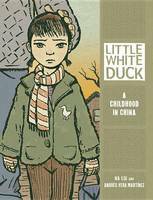 It’s a completely different format, this is a graphic novel, but it looks at a similar time in China’s not so distant history. This book is a collection of stories form the author’s childhood, beginning with the death of Chairman Mao. We also see what her parent’s life was like, and her father’s childhood is much like that of Li Cunxin’s. There are 8 stories in the book, all of which are quite eye-opening, but most told with some humour. It’s stories like these that I think should be shared with every child, because it shows how much has changed. Obviously there are cultural differences for those of us who didn’t grow up in China, but there are universal struggles depicted in this book that can be seen throughout history, in all cultures. It’s books like this one that fuel my appreciation for graphic novels. For me this is the perfect format to tell these stories. For myself and for younger readers I am sure, it’s much easier to grasp an understanding of a culture and time period, when the illustrations are so vivid. As I mentioned earlier, some things may be foreign to readers, like having to help eradicate rats when they become pests. Not only do you have to kill them, but you have to bring the tails to school, to show how many you have killed! One thing that is universal however is being told that you have to finished everything on your plate at mealtimes. In this case the sisters are told of the time when people were starving in China, and some resorted to eating mud, this thought sobers the young girls, and their plates are cleared! While the story is written in English, there are many Chinese characters featured throughout the book, on posters, signs and blackboards. At the back of the book there is a page of translation for each page that features Chinese characters.